Ironman Wales 2015 – Tenby The Second Coming. After racing Ironman Wales in 2014 and ending up in the medical tent after the race, I said to myself never again….. Fast forward four weeks on a night out with some of the guys I raced with, the beer got the better of us all and we all agreed to race again in 2015. One of the challenges with Ironman distance races is the volume of training, they say that the hardest part of the race is getting to the start line injury free, thankfully I was. Ironman Wales is one of the more challenging courses on the IM circuit with a 3.8k sea swim, 180k bike with 8,000ft of climbing (what goes up must come down) and a hilly 42k run (1,800ft) which after the first two disciplines is bloody hard work as you cannot get into your stride. The town is alive and buzzing at 5.00am, with all of the athletes doing last minute preparation in T1 and then it is time to walk through town to the beach, the crowds were already four deep at the harbour and it was only 6.30am, 30 minutes until race time. After the Welsh National Anthem was blasted out over the loud speaker the horn blows for the Pro’s who get a few minutes head start on the rest of the field and then at 7.00am we are off. All 2,000 athletes ready for the race of their year, what they have trained and dreamed off all year long – it was an amazing atmosphere. I was prepared this year for the swim, knowing from last year what to expect of the waves and how they break from right to left as you swim the first 800m to the first buoy. I made sure that I relaxed as much as possible and took a breath at the top of each wave to make sure that I did not get a mouth full of water every stroke. The sea was choppy again this year and although the buoys were 15ft tall you could not see them. I decided to sight on the horizon and the lifeguards who were dressed in bright pink rash vests and lined the course. In most Ironman races the course is a two lap swim which after 1,900m you run/jog on the beach around the “Australian Exit” and go back in for more punishment. At this point you have to make the most of feeling your feet again and lap up the amazing support from everyone on the beach and around the bay. There were over 40,000 spectators over the course of the day in Tenby which is what makes IM Wales such a special event. On the second lap I had an elbow in the face knocking off the goggles I was glad that my two hat strategy saved my goggles as they would have been in the bottom of the Atlantic. The downside was that my contact lens was knocked out and I swam the rest of the lap one eyed, at least I did not swim round in circles. I came out of the Ocean a whole two minutes up on last year and made my way to transition which is up a zigzag hill with hundreds of spectators shouting and cheering you on, grab my shoe bag, pop my contact lens back in and run about ¾ mile to T1. The bike went well for the first three hours until mile 58, which was about 4.5 hours into the event, the quads starting to complain on a long incline and twinge letting me know that they were there. Knowing that I had to tackle the big hills over the back half of the big lap and again on the second smaller lap, I changed my game plan (you always need a plan B, C and sometimes D in an Ironman). I backed off up the hills not to over exert my quads and reduce my heart rate, I hate doing this as I can make places up on the hills on the bike, but this was my plan B and I stuck to it for the rest of the ride. 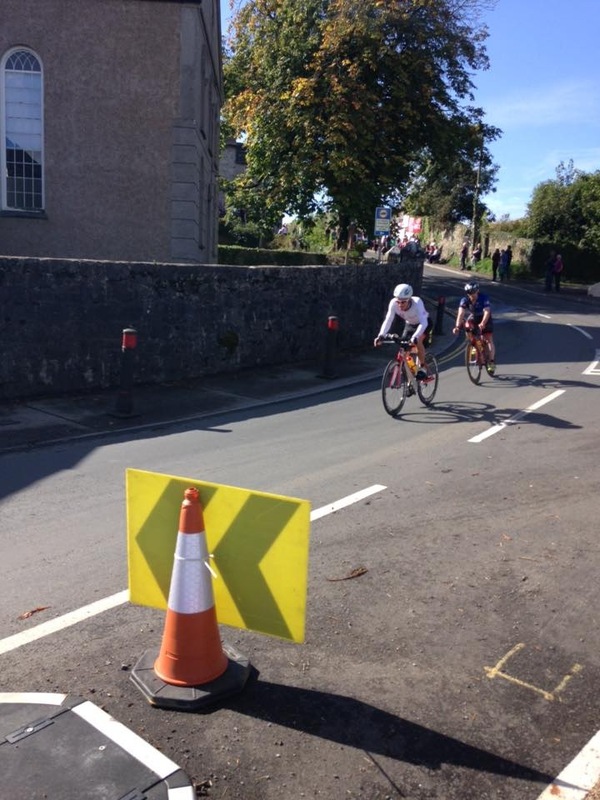 By changing to plan B it meant that I was fresh coming into T2 and ready to smash the four lap run of Tenby. The support I had this year from friends and family was amazing. Seeing my daughters, nieces and nephews multiple times on the run throughout the afternoon really meant a lot to me and giving them high fives and seeing their faces meant the world to me. I would recommend anyone who is attempting an Ironman to get as much support as possible. In 2014 I started the run too quick, this year I had several checks on the watch for the first 5 minutes. The senses still tell you that you are on your bike and with all the adrenaline it is a common mistake to go out too fast on the run and pay later. This year I changed my strategy to run walk the main big hill, different to last year I also made sure that I took on plenty of fluids at the aid stations as it was hot on the run. I did not want a repeat of the calf issues in the last 5k from 2014. The legs started to complain again at mile twelve on a descent. My plan C was to use deep freeze spray on the quads & groin (ouch) and neck a slat tablet which thankfully did the trick for the rest of the race. On each lap you go through a check point at one of the aid stations, they give you an arm band to make sure you have done the right number of laps; triathletes find it hard to count to four. The feeling that you get turning left through the Tenby arches having turned right for the past four hours is one of relief and also elation. 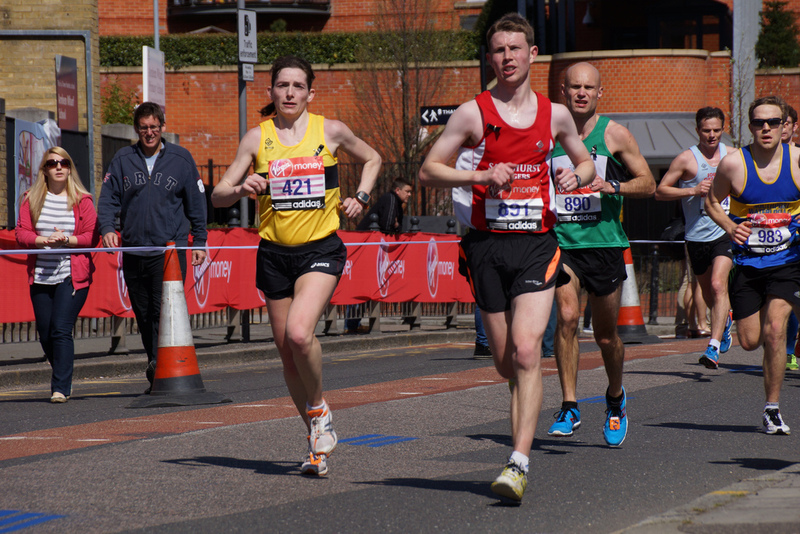 The crowds at the finish were immense and there was just a sea of faces everywhere. The people either side build as the finish line approaches and the red carpet magically appears. I heard some of my supporters but could not see them – by this time my High 5’s were all spent anyway. 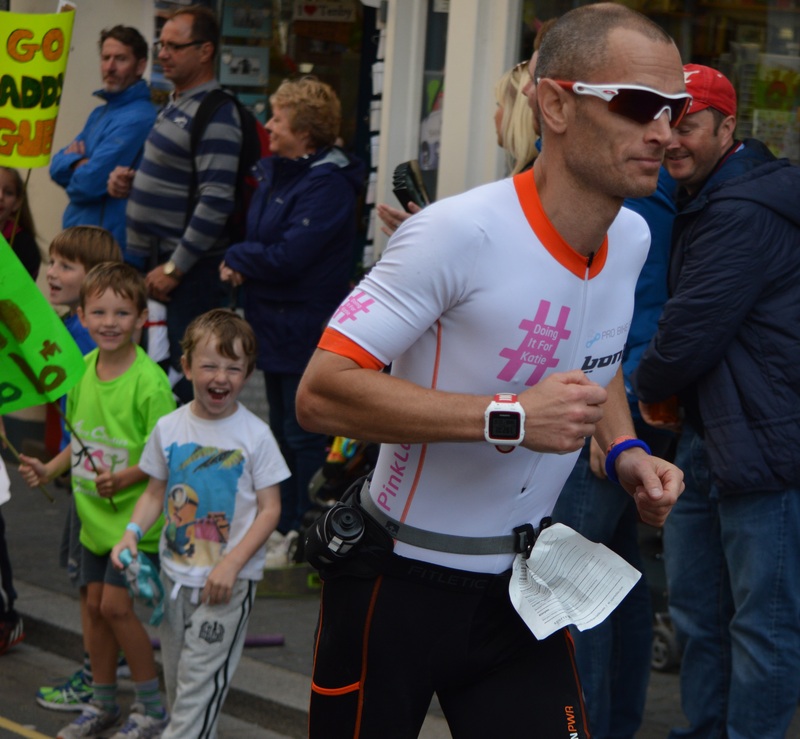 I was ready to run down that red carpet and hear over the loud speaker……”Jonathan Gubb – You Are An Ironman”. Hearing these six words makes the twenty weeks of training worthwhile. I was five minutes quicker than last year, like every athlete I wanted to go quicker, but today 12hrs 45mins was my time. I can safely say that this year I enjoyed it so much more, I was in control, ran my own race and raced strong. Now….38 hours later I was on a plane going to Chicago, still buzzing – but that is another story.